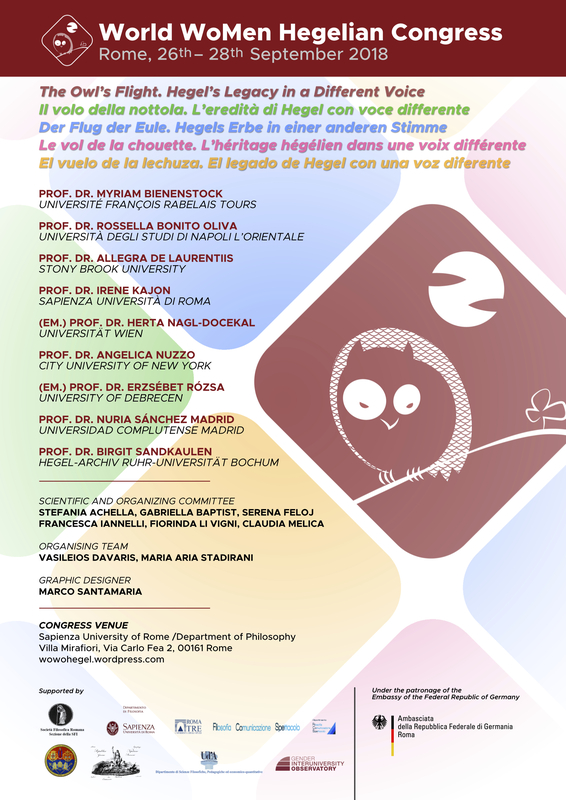 We are very pleased to give notice that the first World WoMen Hegelian Congress will take place at the Sapienza University of Rome (Department of Philosophy, Villa Mirafiori, via Carlo Fea 2) on September 26th-28th 2018. The title’s Congress will be The Owl’s Flight. Hegel’s Legacy in a Different Voice. Below, you can find more information about the event, the poster, and the programme. For more information, please visit the Congress’ website at this link. In the 20th century Hegel’s philosophy was the object of clashing interpretations, which often leaded to dividing perspectives. Left-wing and right-wing, conservatism and Marxism, totalitarianism and liberalism: many adjectives have been used to describe the Hegelian philosophy. From an ideological and political point of view, as well as in a theoretical approach, with particular regard to the idea of system and dialectic, Hegelian thought separated people and philosophers. In the second half of the century, deconstruction of subject and gender, philosophies of difference and feminist thought have privileged original orientations in the research on Hegel, facing in many ways topics otherwise taken for marginal or even ignored. The Hegelian reference to the Owl, emblem of Minerva, makes philosophy and logos the attributes of a female figure, who appears only with the falling of the dusk, at the end of a world. If Hegel invites us in this way to comprehend our time just from that edge, where the present exceeds itself, the conference we propose is meant to accept the challenge: can the Hegelian inheritance be still enriched through other cultures and philosophical languages? Dionisia Valentina Cozzolino, Lorenzo Ferrari, Letizia Lagatta, Chiara Anastasia Moda, Emanuele Nardi, Mateja Lara Schmidt, Giada Scotto. You can download the poster of the event at this link. ‘Maîtrise et servitude’ selon Hegel: manque-t-il l’amitié – et la religion? PANEL 1: Between Nature and Spirit: Which Anthropology? Hegel against and with Women or Other? PANEL 5.1: The Twentieth Century and Hegel: Subversion or Conciliation? PANEL 5.2: The Twentieth Century and Hegel: Subversion or Conciliation? PANEL 5.3: The Twentieth Century and Hegel: Subversion or Conciliation? A different voice, a new figure? What is a true relationship between freedom and love?